San Bernardino Spirit starter Roger Salkeld started this August 1990 game strong and reliever Dave McDonald finished it. By game's end, the Spirit had a 12-1 victory and Spirit manager Keith Body had praise to hand out, according to The San Bernardino County Sun. "Great job by Roger," Bodie told The Sun. "And it was a nice job by McDonald. We played a great game." While Salkeld went on to make the majors over three seasons, McDonald never made it there. 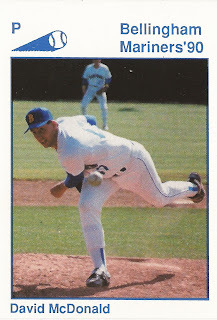 McDonald pitched in two professional seasons. He made it up to high-A San Bernardino, but no higher. McDonald's career began that year in 1990, taken by the Mariners in the 29th round of the draft out of Brandeis University in Massachusetts. McDonald is also credited by his formal name, David McDonald. McDonald turned pro in baseball after he played baseball, basketball and soccer in high school. He also played basketball at Brandeis. He averaged a blocked shot every 2.5 games over 25 contests in 1987. With the Mariners, McDonald started at short-season Bellingham. He got into eight relief outings there, picked up one win and turned in a 1.13 ERA. He then moved to San Bernardino for another nine relief outings. He gave up eight earned in 13.2 innings of work there. McDonald returned to San Bernardino for 1991. In 43 outings, two starts, McDonald went 2-3, with a 5.33 ERA. He also earned two saves. That season marked his last as a pro.